The AWEX EMI closed the week at 1801c, down 17c, in a more realistic result at this week’s auction sales in Australia. The 54,350 offering, in this raging upward market trend, provided the buyers the ability to be more selective in their purchases, as well as the increase in the AUD USD Exchange rate increasing to levels as high as 80c. The larger selection in the Merino Fleece sector saw the return of the discount for low strength, high midpoint break, and other qualifiers that normally attract a discount to the base types. Conversely 16-17.5μ were very well supported and posted positive price results between 5 and 40c. The fine sector 18-19μ is where the market eventually came under price pressure as did the medium (19.5-22μ) all falling between 10-35c for the week. Merino Skirtings held up a little better. Exporters were attracted to lots with low VM and the best specifications, conversely the heavy VM skirtings came under some price pressure and this sector represented the highest pass in rate for the week. Crossbreds also came under price pressure across the entire MPG range mainly as a result of the size of the offering and almost certainly as a result of the rising currency exchange rate with the USD. Well classed and prepared lines were the most resilient in the falling market. Merino Cardings reversed its bull trend after climbing to a new price record last week. The Merino Carding Indicator saw a price reduction between 31c (2%) in the north and 58 and 61c (down 4%) in the Southern and Western regions. Despite this prices for Merino Lamb’s wool were still on the climb closing the week generally 20-30c. 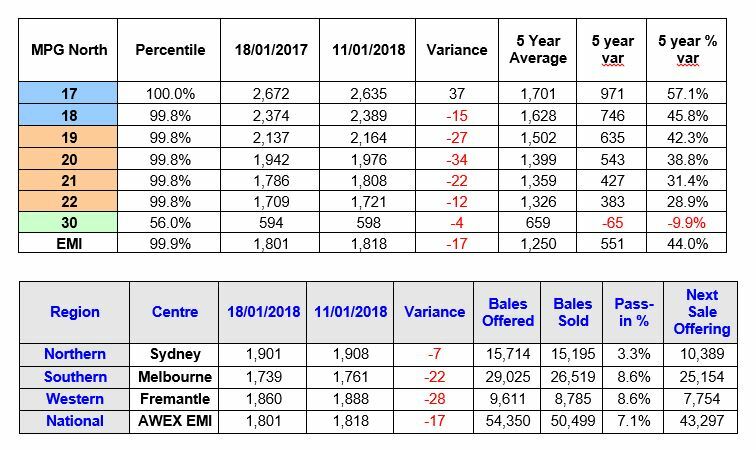 Quantities for next week fall back substantially to 43,297 bales (largely due to the Australian Day holiday) – the following two weeks are expected to be around 40,000 bales. Forward Market Report– Mike Avery (SAW) The spot auction market finally succumbed to the pressure of a strong AUD and high price levels. The auction has been on a steady (and at times strong) rising trajectory since the end of September putting funding pressure on exporters and processors alike. All merino microns, 18.0 through to 22.0, fell 20 cents. Forward markets traded steadily early in the week at anticipated levels with 19.0 reaching a high of 2140 for 19.0 micron and 1760 for 21.0 microns. Forward prices held during Tuesday and into Wednesday but the falls in the spot market began to impact the forward levels particularly into the late autumn. Bidding interest remains but at slightly cautionary levels. Exporters are still looking to manage their risk as volatility is expected to continue throughout the year. We expect opportunities for growers to hedge, particularly in the Autumn window, to still be there but possibly on restricted volumes. Commentary: The correction in the market this week drew some questions to the longevity of the wool market trend and its future price direction. I would start by saying that one market does not constitute a trend. An appreciating currency exchange and a rather large offering could be used to justify the 1-1.5% market movement. However the fall in the fine and medium Merino MPG’s is more than likely a pause in a trend that has been relentless since September 2017. Our market intelligence indicates that merino wool is experiencing a period of high demand, low or no pipeline inventory and expected static supply. I believe there is a case for the market to maintain the wool market around this level whilst stability of the world’s influential economic powers remain rational. Exporters and processors need to rise to the challenge of financing the new cost of wool, which has had most players in the pipeline enter into negotiations into applying for extended trade finance. Demand in the growing middle class in China looks set to increase with the population and appetite to grow into their new wealth.